Ian Cover is a founding member of the ABC radio team’s The Coodabeen Champions who have been broadcasting their Aussie Rules program for over 30 years. An entertaining and professional MC, he has entertained and thrilled countless corporate, charity and sporting events. Ian’s radio background has helped him get the most out of interviewees and guests. 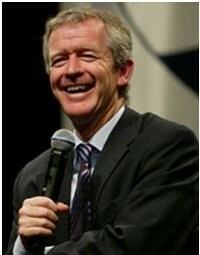 With plenty of stories to share as a keynote speaker, his anecdotes are always humorous and lively. Ian’s services are regularly in demand with several business and sporting organisations. Ian has been the in-house MC with Cricket Victoria for over 20 years. He has played a key role in building the Lindsay Hassett Club, Melbourne’s best corporate sports lunch. Ian is in the 22nd year as resident compere of the Pivots Coterie at the Geelong Football Club, hosting many of the Cat’s major functions. Starting as a cadet journalist with the Geelong Advertiser, after five years he later moved to Herald and Weekly Times as a business reporter. He has written for all the Melbourne papers and regularly writes columns for sporting magazines. Ian has written two books with the Coodabeens and a best seller with former Test cricketer Merv Hughes. He has also hosted breakfast radio with John Blackman on 3UZ and with John “Sam” Newman and Darren James on 3AW. Ian’s career has also included television hosting duties on Optus-TV’s Footy Focus and is regular guest on Good Morning Australia with Bert Newton. An ambassador of sorts for his hometown Geelong, in 1996 he was elected Member for Geelong Province in Victorian Parliament. Following his 2002 election defeat he returned to media and public speaking. Ian can liven events in tandem with his Coodabeens colleague: singer-guitarist Greg Champion. The duo have performed countless times with Ian as MC and then leaving the podium to join Greg in the odd number and encouraging audience participation.